With the Dow sitting above the 14,000 mark, investors head into the week awaiting data on factory orders and more corporate results. The Census Bureau will release data on factory orders for December at 10 a.m. ET. 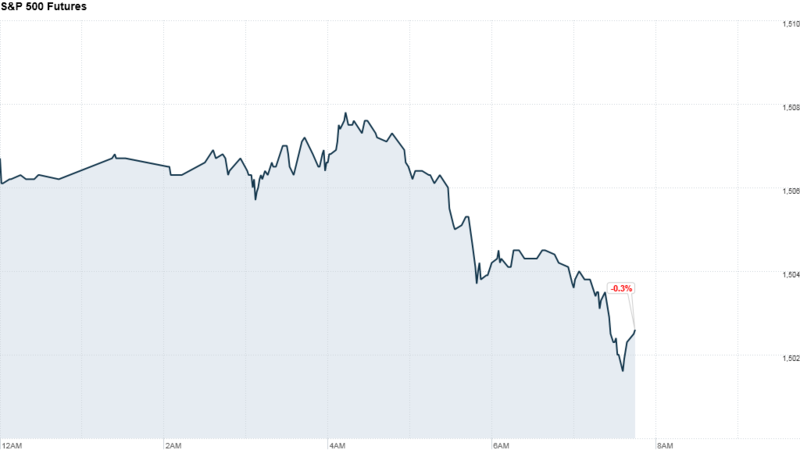 U.S. stock futures were lower ahead of the opening bell on Monday. Firms including Royal Caribbean Cruises (RCL) and media company Gannett (GCI) will report quarterly results before the bell. Yum! Brands (YUM) will report after the close. Disne (DIS)y and B (BP)P will release quarterly results on Tuesday. Shares of Dell (DELL) were slightly lower in premarket trading on talks the company could go private early this week. Microsoft (MSFT) is reportedly poised to assist in financing the deal. Facebook (FB) shares were also lower in early morning trading, as the social networking site marked the ninth anniversary since its inception. U.S. stocks rallied Friday, with the Dow closing above 14,000 for the fist time since October 2007. European markets were lower in morning trading. Asian markets ended mixed. The Shanghai Composite added 0.4% and Japan's Nikkei advanced 0.6%, while the Hang Seng declined 0.2%.